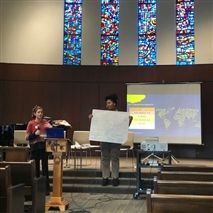 On Jan. 26, five NCS students attended the DMV Interfaith Leadership Summit at American University School of International Service, the first high school students to take part in the annual conference. Mary Rose Bell ’20, Sophia Charles ’20, Charlie Cooper ’20, Sophia McNicholas ’20, and Noor Saleem ’20 spent their Saturday hearing reflections from prominent leaders in the D.C. area, enjoying music, and attending workshops. 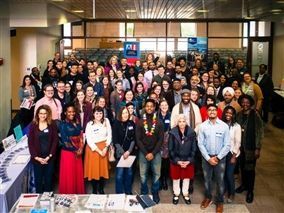 The summit is geared toward young adults from many religious, ethical, and cultural traditions, and the NCS cohort was organized by Melody Fox Ahmed, the new director of global programs, who frequently attended the conference in her previous role at the Berkley Center for Religion, Peace and World Affairs at Georgetown University. NCS students were among the most active participants, Fox Ahmed said. At one session, McNicholas quickly volunteered to present on her breakout group’s discussion to the crowd of local leaders. “I was really impressed by the students’ enthusiasm and engagement. They were some of the most vocal participants in rooms of older and experienced community activists. They directly related what they were learning to situations they have experienced at NCS,” Fox Ahmed said. The students drew praise from conference participants for their confidence and insights, Fox Ahmed said, and they were invited to return next year and present their own workshop. The students aim to bring much of what they learned back to NCS to help advance an inclusive educational environment, one of the priorities in the 2018-2023 Strategic Plan. Sophia McNicholas ’20 presents her breakout group’s reflections during a session on race and belief at the summit.